Dorjee Tsering, a 16-year-old exile Tibetan schoolboy who immolated himself on Feb 29 in Deharadun, India. 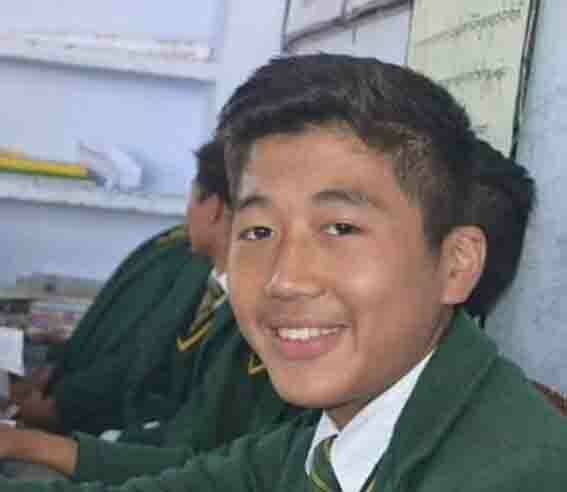 (TibetanReview.net, Mar05’16) – Dorjee Tsering, a 16-year-old exile Tibetan schoolboy who immolated himself on Feb 29 in Deharadun, India, to draw global attention to Tibet’s plight under Chinese rule, has died in the late evening of Mar 3 in a hospital in New Delhi. The Tibetan suffered 98 percent burn injuries and died late Thursday (Mar 3), AP Mar 4 quoted Pankaj, an official at New Delhi’s government-run Safdarjung hospital, as saying. The boy was previously reported to have expressed a determination to do something for Tibet. But his parents, who live in Manali, did not imagine that the youngest of their five children, would take such an extreme step. He self-immolated outside a Tibetan old people’s home in Herbertpur, near Dehardun, where his uncle lives and whom he and his mother were visiting. The Tibetan Youth Congress, the largest grassroots exile Tibetan organization and which campaigns for Tibet’s independence from Chinese rule, has expressed sadness over the boy’s death. “We offer our highest respect, honour and salute for his sacrifice for Tibet’s freedom and Independence,” it said in a short statement. It plans to hold a grand funeral for him at Dharamshala, the exile Tibetan headquarters where it is based, but in keeping with the wishes of his family.